Thanksgiving has come and gone, and we move on to the coming of Christmas and the ringing in of a New Year 2019. We have much to be thankful for, and among those gifts is the fact that the Tent of Nations still stands as a bright, shining star outside Bethlehem – a beacon of peace with faith, love and hope serving as their simple, basic pillars of belief. 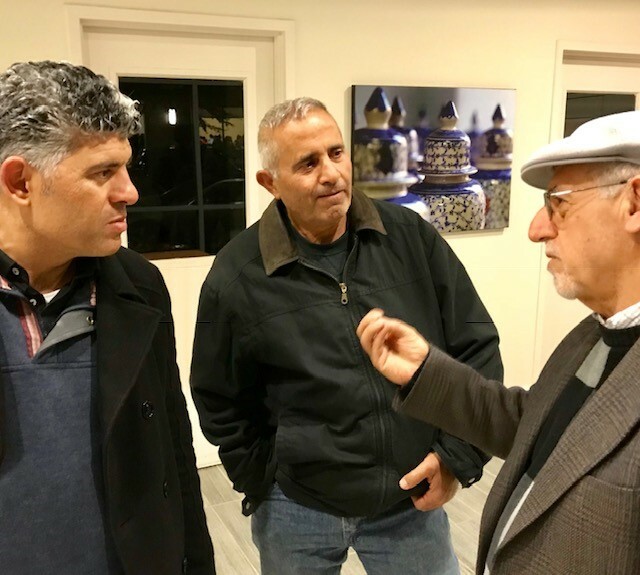 Daoud tells the story about one Christmas when there was a very bad storm that knocked out the electricity in all of the settlements surrounding the farm. In the middle of the night with a suddenly darkened landscape, the farm, lit up with electricity provided by their solar panel batteries, was the only source of light for miles around. The family went around and turned on every light they had – shining beacon on a hill, indeed! As it seems that more and more people are finding it difficult to relate to the “other,” the midterm elections here at home have shown that the face of America is finally being reflected in the broad-based swath of individuals who will be sworn into office in January 2019. Who would have dreamed of a Palestinian-American woman entering into the halls of the House even a year ago? We hope that the message from Daoud Nassar, which has been heard by hundreds and hundreds of people across the States, may have had some impact in opening hearts and minds to the possibilities of change – welcoming the new faces of America into our homes and on our television sets and Facebook pages and, yes, even by way of our tweets! I love the way my own heart has been opened up by our ongoing relationship with the Nassar family. Over time, I have learned to see the Palestinian people through a very different lens because of our work with this incredible family. I thank them for this gift, and I have a feeling that each of you might feel much the same. We are grateful for all the support offered by so many individuals during the Fall 2018 Tour in November. It was a very satisfying week, thanks to Beth Moore, our FOTONNA Tour Coordinator, and her cohort of volunteers. 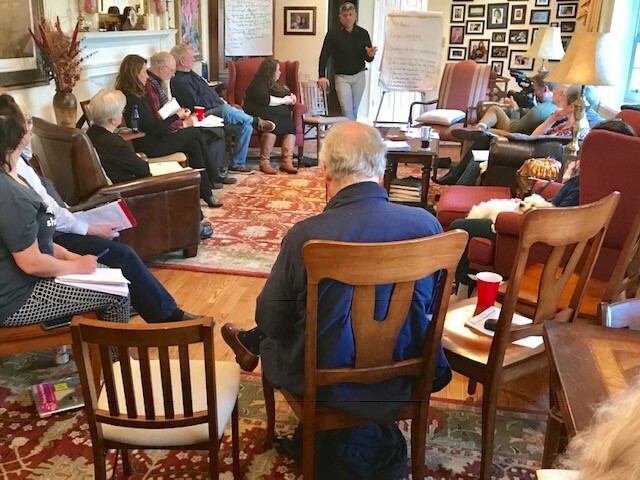 The hosts were wonderfully generous by opening up their homes and hearts and doing the hard work of organizing events in Richmond, Harrisonburg, Charlottesville and Williamsburg. Thanks to all of you! 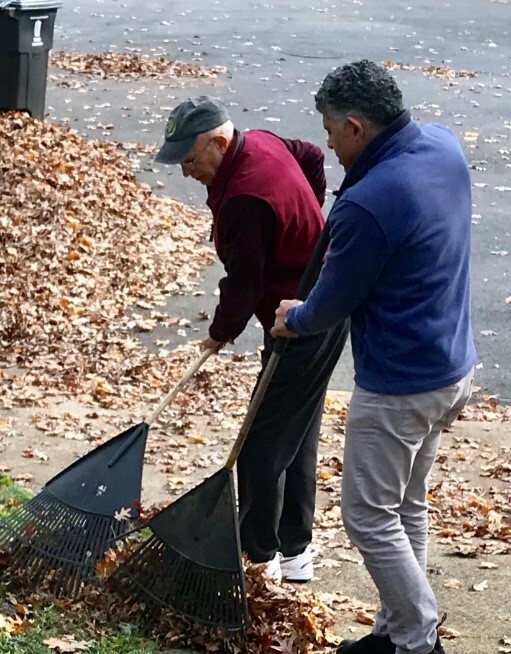 Bill digs cisterns on the farm and Daoud rakes leaves on our land! And, the gift keeps on giving. This message is from our AC member, David Benedict, who hosted a large gathering of folks during our tour on November 14 at Williamsburg United Methodist Church. It is about two people who attended the event that night. It’s both inspiring and encouraging! For the Christian community, this Sunday (December 2) begins the season of Advent. It holds a dual function for us – looking back to the holy night, affirming the greatest gift of God in the small vulnerable packaging of a child, and, beyond that, hoping into an uncertain future the fulfillment of this gift in the final reality of God’s promise. While there is so much distrust and division among us, even in our congregations over such issues as sexuality, we must focus on a larger vision, beyond my seeing and our collective, meager, limited imagining – a possibility for human peace. If there is a common thread instilled in our creation, this season of Advent calls out for us to patiently ponder and wait expectantly for fulfillment of the promises embedded in the child of peace. Can we surrender or release our hardening anxieties, not relenting on vigilance, but releasing our walls of separation to find a newness, an inspiring direction? I heard a very powerful story that embraced this vision. 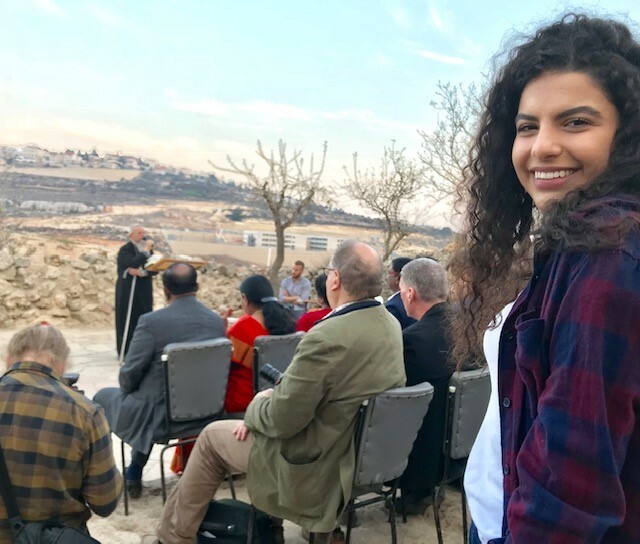 A farmer outside of Bethlehem who is giving a living testimony of not allowing their family to become a settled “victim.” The Nasser family dream of the Tent of Nations does not want enemies, but believes that Palestinians – Christian or Muslim – and Jews are human beings. The dignity of a common DNA, as children of God, invites the possibility of mutual affirmation in their humanity. This Advent invites the courage and the faith of reimagining a world that is ruled not by fear but spirited by hope. Can we imagine the tearing down of walls, not building larger barriers, including all God’s children, not excluding within our sacred walls of worship? If anyone else has a personal story to share, please send it to: kayplitt@comcast.net. We would love to hear from you and place your story on our website. Each year during Daoud’s fall trip, members of the FOTONNA AC and SC get together to share a “What’s up?” session. On November 17, Nadia and Paul hosted at their home once again. There was lively discussion and great food (even some leftover Halloween candy!) and some major issues addressed. The SC is looking at the question of succession; we would like to see some fresh faces willing to come in, learn about what/how things are being done at this point, and bring in some new ideas and energy for the future of our work. If interested in learning more about what we need and whether you might want to take on some of the work, please contact Bill Plitt (williamplitt@gmail.com) or Kay Plitt (kayplitt@comcast.net). In the last Newsletter, we made a modest appeal for funds to support the Women’s Education Center in Nahalin with the hope that they could eventually get a potter’s wheel, kiln and other supplies in order to make some lovely pottery to both use and sell. We also asked for support for our volunteer scholarship funds. People have been very generous so far, and I think we will be able to get Jihan the funds she needs and provide some more scholarship support for 2019. Thanks to all of you who responded to this modest request; we will keep you updated on the progress. If you think you can provide support, please see the TON website – www.tentofnations.org – for more information on how to take advantage of this opportunity. There is some limited scholarship support available for those who qualify. 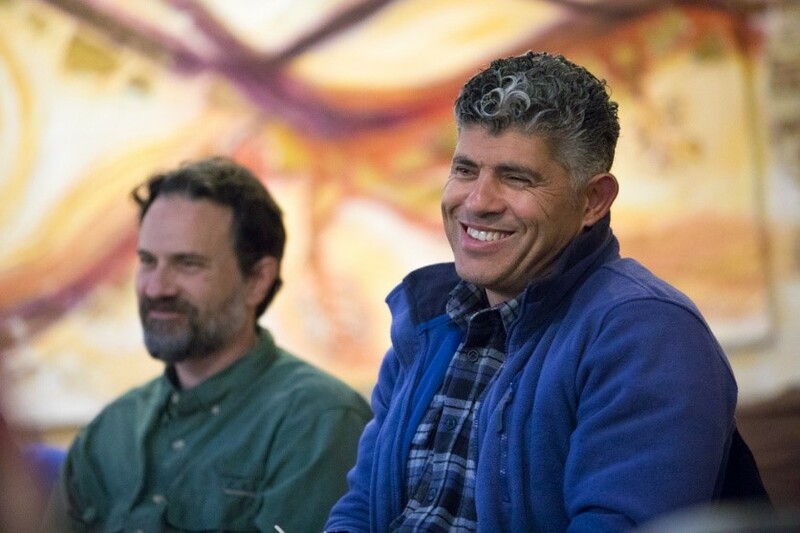 In 2019, Daoud will be focusing on Land Management as a broad area of needed support. He hopes to purchase a used tractor (safer than the one they have been using), a used cultivator and a variety of farming tools. Many of the other projects are in fairly good shape, thanks to the support from all of you and other international visitors and groups. He is narrowing his focus for the coming year out of concern that the roads may soon be made very difficult to navigate, and the equipment needs to reach the farm as soon as possible. The noose around the area keeps getting tighter and tighter. This request also covers cisterns, tree planting, harvesting, etc. – anything related to cultivation and management of the land. Jean-Yves Le Drian, Minister for Europe and Foreign Affairs and his German counterpart, Heiko Maas, announced the winners of the Franco-German Prize for Human Rights and the Rule of Law on November 21. One of the prizes goes to Daoud Nassar and the Tent of Nations. There will be a ceremony held in December 2018 where the award will be formally recognized and awarded to the Nassar family in Bethlehem. 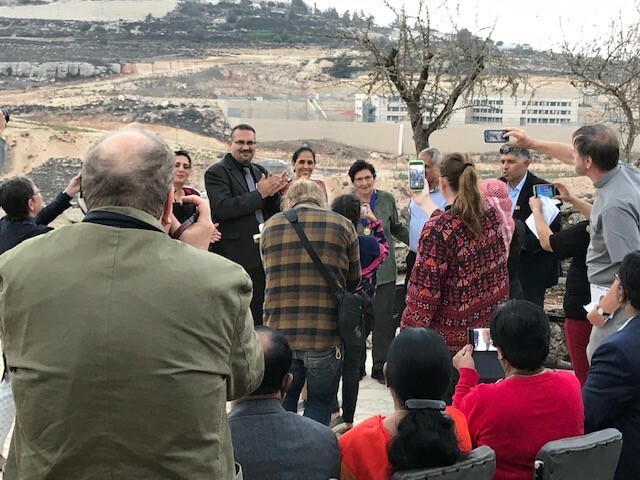 In addition to the 2017 World Methodist Council Peace Award delivered to the Nassars on the farm on October 11, 2018 (see photos below), this Franco-German Prize is another amazing recognition of this simple message: “We Refuse to be Enemies. We wish you the time and energy to do all you need to do over the next month – and the time and energy to enjoy the quiet moments needed for reflection and rejuvenation during this upcoming season of faith, love and hope. Then, let’s put our words into action! Happy Holidays – in whatever tradition you find the most satisfying! May 2019 be a year of giving and caring. P.S. Nadia Itraish, one of our Steering Committee Members, is a member of a small group hoping to support four farmers in the West Bank (including Daoud) with providing volunteers to work on their farms. Their organization, Growing Palestine, is having a fundraiser on Sunday, December 16, 2018 from 6:00-10:00 p.m. Tickets are $60.00. You can go to their website at: https://www.eventbrite.com/e/growing-palestine-holiday-hafla-tickets-52193518218 for more information and to purchase tickets, or you can visit their website at: www.growing-Palestine.com.